I am 20 years old. In the eyes of society, I still have a ways to go in life, but I am slowly and surely gaining responsibility and freedom. I can legally drive a car, vote for the politician of my choosing, travel outside of the country on my own, move away to attend college, accumulate student loans, spend the summer doing mission work, and if I wanted to, I could even get married. (Don't worry Mom and Dad–I've got lots of time before I hit that season of life!) In the eyes of our society, I am learning to be an adult and am progressing at a pretty normal rate. However, during my time at the South Texas Children's Home Ministries, my eyes have been opened to how much I am still like the 2 year old, Matthew, who I see every day as I walk with Christ. Just like a 2 year old who is learning to speak, I am learning to use my words appropriately. Everyone is entitled to their opinion and they are all free to post it on Facebook, within their own blog or put it on a bumper sticker. As I become older, it's no surprise that I have seen people twist their words and change what they stand for. Each and every moment I have to pause and remind myself that my words should possess the love and thoughtfulness, which imitates the love of Christ. My words are a powerful tool and I am still learning vocabulary, how to define who I am and how everything that is said affects me or someone else. Like a 2 year old, I have to be comforted on a daily basis. Day and night, God hears me pout about how I was treated unfairly today, my complaint of my unchanged circumstances when He is trying to change my heart and my cry in the middle of the night when I awake from a nightmare that seemed oh so real. Everywhere I go and in every season of life, God is there to hold my hand and point out truth that I had forgotten. He reminds me that "death no longer has mastery over him" and because I am His, death no longer has mastery over me. Like a small child running away from a parent with a wooden spoon or anyone with a tone that signals discipline, I run away from God again and again. In small moments throughout the day, or in an area of sin in my life I try to close off from God, I consistently fall short of who I am called to be. Whether it is out of fear or because I intentionally try to flee from His presence, every time I turn back He is there waiting with open arms. Each and every time Matthew sees me, his face lights up, he reaches his arms up, and he meets me with the most incredible hug. I am reminded that the joy I feel when Matthew hugs me is just a glimpse at what my Heavenly Father experiences when I turn back and come running to Him. I am a daughter of the King, and He rejoices when I return to Him each day. There is an unconditional love waiting for me to come home each and every day. This love never runs out, never tires of my consistent mess ups and never lets me forget that I belong to the living God. 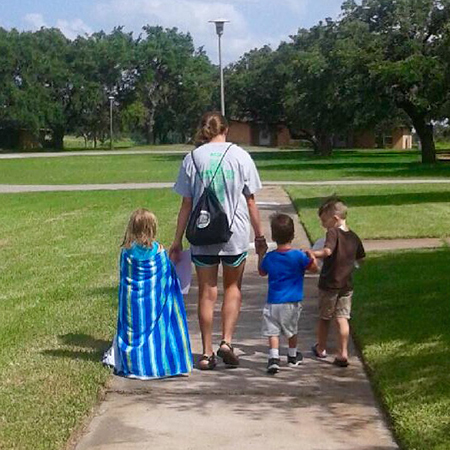 Katie Burkhead, a student at the University of Texas at Austin, is serving a summer mentor at the South Texas Children's Home Ministries through Go Now Missions.